April Jehan Morris (Co-editor), Elizabeth Lapina (Co-editor), Susanna A. Throop (Co-editor), Laura J Whatley (Co-editor). 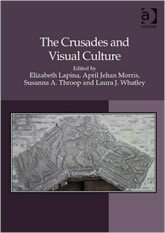 The Crusades and Visual Culture. Ashgate, 2015. The crusades, whether realized or merely planned, had a profound impact on medieval and early modern societies. Numerous scholars in the fields of history and literature have explored the influence of crusading ideas, values, aspirations and anxieties in both the Latin States and Europe. However, there have been few studies dedicated to investigating how the crusading movement influenced and was reflected in medieval visual cultures. Written by scholars from around the world working in the domains of art history and history, the essays in this volume examine the ways in which ideas of crusading were realized in a broad variety of media (including manuscripts, cartography, sculpture, mural paintings, and metalwork). Arguing implicitly for recognition of the conceptual frameworks of crusades that transcend traditional disciplinary boundaries, the volume explores the pervasive influence and diverse expression of the crusading movement from the twelfth through the fifteenth centuries.